EASTON, PA--(Marketwired - December 09, 2015) - The highly requested Rocky Patel 20th Anniversary review video is being released by the digital cigar and men's lifestyle magazine Cigar Advisor. Cigar Advisor brings a fresh, irreverent, and down-to-earth perspective on all things cigars to thousands of smokers. In addition to educational cigar content and behind-the-scenes cigar industry articles from some of the business's top names, Cigar Advisor delivers an array of content about a variety of topics of interest to people who enjoy the cigar lifestyle, including pairing review videos such as this one. The Rocky Patel 20th Anniversary is a particularly special cigar to founder and president, the man behind the brand, Rocky Patel. Made to celebrate his 20th year in the business producing premium hand rolled cigars that smokers around the world love, Rocky took extra time and care to blend this cigar so all can help celebrate this momentous occasion, no matter if they are mild or full bodied smoker. The 20th Anniversary is a pure medium bodied cigar with a load of complex and deep rich flavors due to a Honduran wrapper and binder encasing a mix of Honduran and Nicaraguan longfillers. 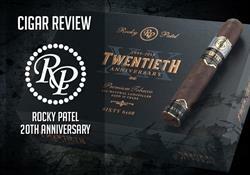 Cigar Advisor reviewer and Managing Editor John Pullo was quoted as saying about the Rocky Patel 20th Anniversary "Rocky Patel certainly raised the bar with his new 20th Anniversary. From the moment I lit the cigar to the moment I set it down, I experienced wave after wave of new and interesting flavors. It seemed like no puff was the same as the last in the best way possible. The complexity was astounding and kept your palate searching for the new emerging flavor, while not proving to be overpowering in strength. I can't imagine a better cigar to celebrate 20 hard-working years in a tough industry. Rocky, congratulations from myself as well as the staff here at Cigar Advisor and Famous Smoke Shop. We wish you many more years to come." Rocky Patel 20th Anniversary cigars are available at Famous Smoke Shop, and are packaged in boxes of 20 cigars a piece. Each of these Honduran wrapped cigars comes in your choice of a 7 ½ x 38 Lancero, 4 ½ x 50 Rothschild Box Pressed, 5 x 54 Robusto Box Pressed, 6 x 52 Toro Box Pressed, and 6 x 60 Sixty with an individual MSRP ranging from $9.65 to $12.80 per cigar. People interested in learning more about the Rocky Patel 20th Anniversary or Famous Smoke Shop should visit www.Famous-Smoke.com or call 800-564-2486. For those interested in learning more about Cigar Advisor, log on to www.cigaradvisor.com.